Discover architectural opulence at its best with the heritage trail of the great living Chola temples in Tamil Nadu. The train reaches Thanjavur in the hour before sunrise. It’s the hour of the Gods. The very air seems to resonate with the sounds of worship even as great flocks of birds call to each other as they fly across the rich riverine delta known as the rice bowl of Tamil Nadu. This is the land that was once home to the magnificent Chola Temples dynasty. In the early years of the 10the century A.D. under the patronage of the Chola emperor Raja Raja Chola 1 the Great (985-1014) it was an empire that shone like the Sun itself, rising in the East and spreading its rays in every direction. From its ports great argosies of ships left for other parts of South Asia taking with them ideas of kingship based on cultural and religious themes that found their manifestation in architectural marvels caved out of stone that took different forms in their new homes. This is what makes the grand Chola Temples that Raja Raja Chola I built at Thanjavur such a piece of living history. It’s a compendium of all the arts of sculpture, painting, architecture, as well as the allied ones of music, dance, jewellery, textiles and bronze casting for the marking of idols and temple vessels for there used to be a thousand and more temple dancers who regularly performed the daily ritual of worship at the Brihadeshwara temple of Thanjavur in its heyday. It’s also an engineering marvel of its time. Of course, today we tend not to notice the imposing height and enormous capstone that crown Raja raja’s edifice or mountain of dressing and carved stone because verticality or gravity-defying buildings are no longer an issue. What’s striking is the exquisite attention to detail. You stare into the dark niches that surround the inner walls of the temple and come face to face with marvelous bronze statues. Many of these have been relocated to the Thanjavur Art Gallery attached to the Thanjavur Palace. You climb into the inner corridors that have been created around the base of the main tower and come upon magnificent wall painting the illuminate the glory of the King-Emperor or explain episodes in the lives of the Gods and Goddesses who live in the temple. There are other corridors in which the varieties of dance poses and their mudras (hand gestures) are enumerated, perhaps for a quick reference by the celebrated temple, dancers. In those still, dark, spaces illuminated with a mere torch, with the scent of camphor, sandalwood oil and jasmine seeping through the crevices of the main sanctum, you can almost feel the presence of Raja Raja Chola himself. He was just one amongst a great family of builders. He set the trend amongst his immediate family so that there are tributes in stone built by and for personalities like Sembiyan Mahadevi, the wife of his grand-uncle Gandaraditya Chola that entices the visitor with their languid grace and immense beauty. 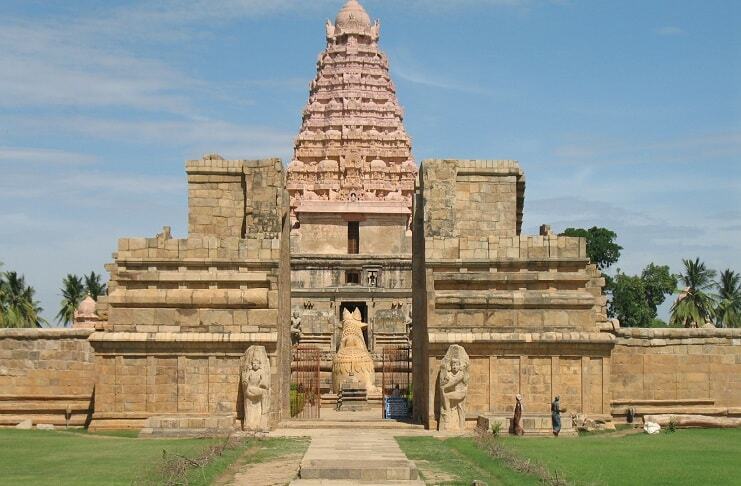 Those who are fortunate enough to follow in the trail of the Cholas, after visiting the Temple of Brihadeshwara, take the road to Gangaikonda Cholapuram. The name signifies that Raja Raja Chola’s son Rajendra Chola I (1012-1044) a great conqueror and strategist had marched his troops all the way up to the Ganges and brought the sacred water down to his capital in the Trichy district – creating his own version of a Shiva temple that is also called Brihadeshwara. It’s not quite as grand as the first, but the enormous figures carved in their separate niches, some of which are said to be of the king to venture into other lands with his armies. His influence can be traced to Sri Lanka, Burma, Cambodia, Thailand and the kingdom of Srivijaya in what are now part of the Malaysian peninsula and some of the major islands that make up Indonesia. The smaller, but still exquisite temple at Darasuram built by Raja Raja Chola II (1146-1173) us full of finely carved pieces of sculpture in polished black stone that forms a striking contrast to the granite of the niches surrounding the main structure. The main porch incorporates the suggestion of a chariot pulling the temple forward as in the style of the Konark Sun Temple. The contact with these different cultures meant a great flowering of ideas between the rulers of the Chola Empire and their distant neighbors. It lingers in the most tantalizing of ways in the telling of legends that speak of merchants and princes being shipwrecked in stage lands only to be rescued by princesses that are described as belonging to exotic tribes, quite often referred to as Nagas, or of textile traditions surviving through the centuries in certain motifs and weaves, or more dramatically in the temples that are still to be seen carved in dreaming spires enclosing any number of different gods and their representatives, the God-kings on earth. At such moments it seems as if the golden age of Raja Raja Chola I continue to spread its radiance. The capital city of Chennai is home to Fort St. George, Marina Beach, and Guindy National Park. The spiritually inclined can visit the Kapaleeshwarar temple, Parthasarathy temple and the San Thomas Basilica. When in Kanyakumari, one can enjoy the beautiful sunrise and sunset from the Sangam (confluence of the Bay of Bengal, Indian Ocean, and the Arabian Sea). The Vivekananda Rock Memorial and the adjoining temple are the main tourist attraction here. Udhagamandalam formerly known as Ooty is one of India’s most famous hill stations. The botanical garden, St. Stephen’s Church and the Government Museum are places of interest here.